If you’re a seasoned hunter, you’re probably already familiar with many of the benefits of hunting from a ground blind. These structures offer a convenient, easy way for hunters to conceal themselves so that they can spot their target before their target spots them. They can also make a long day of hunting more comfortable by giving hunters a place to kick back while they wait for an unsuspecting deer to pass by. Furthermore, hunting from a ground blind is typically safer and less physically demanding than climbing into a tree stand. One trait of ground blinds that often goes underappreciated, however, is there usefulness as teaching tools for new hunters. A hunting blind offers an isolated, controlled environment where a veteran hunter can train and mentor a less-experienced friend or family member who’s interested in learning the ropes. Spending the day in a ground blind can be a great way to introduce young folks to hunting as well. Hunting from a ground blind can foster a relaxed, laid-back atmosphere that may be less intimidating to novice outdoorsmen and children than other hunting practices. In essence, you can think of your ground blind as a classroom from which to teach new hunters the skills the need to succeed. 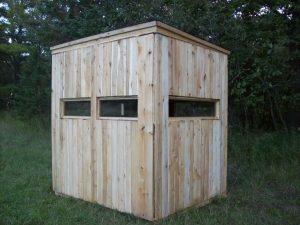 At Productive Cedar Products, we design and manufacture a 5’ X 6’ two-person deer blind that’s ideal for giving lessons to beginner hunters. Thanks to its 5 hinged windows, this deer blind provides clear vantage points from all four sides of the structure. To learn more about this or any of the other hunting blinds we offer, feel free to give us a call or contact us online today!